Established in 1982 and headquartered in Minneapolis, MN, Buffalo Wild Wings, Inc. is firmly established as the dominant sports-themed dining chain in the U.S. 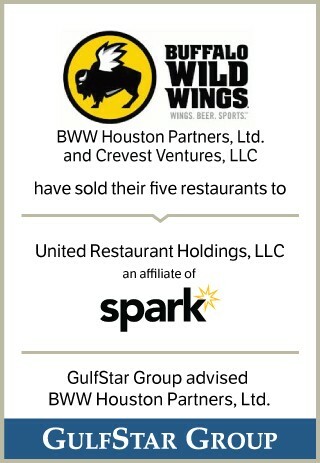 The BWW Houston Partners, Ltd. entities were comprised of stores located in the greater Houston metro market: Sugar Land, Copperfield, Hedwig Village, The Woodlands and Atascocita. Prior to the acquisition, BWW Houston Partners, Ltd. was managed by Stephen Chappelear and Clifford Sadowsky, two of the longest tenured franchisees in the BWW system.